Fredricka Holloway, forty, is a youth worker and a triathlete. She lives in South Shore. She ran her first triathlon in 2007 and has run forty more races since then. It’s 5:04am and the glimmer of new light grazes the horizon and crawls across the calm waters of Lake Michigan as I stand and stretch at 63rd Street Beach. This is the only time of year that the sun rises early enough for my morning run to coincide with it and with the growing warmth and occasional breeze that smells of manure and fresh-cut grass. This moment, plus a calendar full of triathlete races for me to conquer, is when I recognize that summer is officially here. Chicago’s sun season is known for its festivals, attractions and concerts. But for those of us who bike, swim and run, it’s the season for bringing our races outdoors. I entered my first triathlon in 2007, and now? I’m booked most weekends for an event or for training, but the schedule gets heavier toward the end of summer. While everyone else is gearing up for Memorial Day weekend to enjoy a barbecue or a family reunion, I’m prepping for The Gospel Run, which is June 4. It’s a 5k; it’s three miles. It goes along the beach at 39th Street. They have this warmup where they play gospel music. A lot of people walk. Quite a few churches participate with teams. I am participating as one of the members of Trinity Church of Christ’s team and representing our Athletes for Christ ministry. I’m the chairperson [of the team]. As June ushers in warmer weather, you will find many of us at Ohio Street Beach taking advantage of our first opportunities to swim and train in open water—versus a pool during the colder months. Each year of races is different for me. There have been years that I have done only three to five athletic events over the summer to stay active. But in the last two years I’ve intentionally scheduled full seasons of fifteen to twenty events. For me it’s about being able to set higher goals, challenge and push myself, and even overcome fears and setbacks, while enjoying the diversity of what Chicago has to offer. Every summer, Chicago becomes a huge athletic playground. One of my main events is the Chicago Triathlon. There’s the Expo, which is usually on Friday and Saturday, the SuperSprint and Kids Tri on Saturday, and the Sprint and Olympic Triathlon on Sunday. I must admit that though I’ve participated in this event for four years, it has been my nemesis. Even in the summer, the waters of Lake Michigan vary from day to day, which can prove intimidating to anyone, including seasoned athletes. For the SuperSprint, which is a shorter distance, I’d say the water is about six-to-seven-feet deep. Last year the water temp was approximately sixty-five degrees so it was colder than normal. It was shocking. I don’t have a wetsuit. 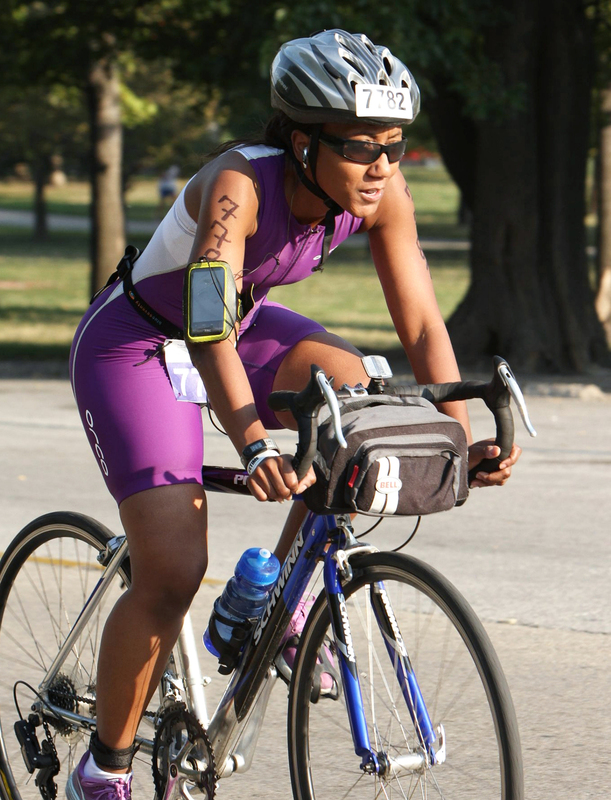 Chicago Triathlon, August 28. Spectators are welcome at the Grant Park finish line. A great place to catch runners is at the CLIF Energy Zone located at Mile One (just south east of Lake Shore Drive and Balbo near the Field Museum). The Gospel Run, festival and gospel concert, June 4. 7 am Spectators are welcome at Oakwood Beach. The gospel concert begins after the race ends.